Xylooligosaccharides (XOS) have gained increased interest as prebiotics during the last years. XOS and arabinoxylooligosaccharides (AXOS) can be produced from major fractions of biomass including agricultural by-products and other low cost raw materials. Endo-xylanases are key enzymes for the production of (A)XOS from xylan. As the xylan structure is broadly diverse due to different substitutions, diverse endo-xylanases have evolved for its degradation. In this review structural and functional aspects are discussed, focusing on the potential applications of endo-xylanases in the production of differently substituted (A)XOS as emerging prebiotics, as well as their implication in the processing of the raw materials. 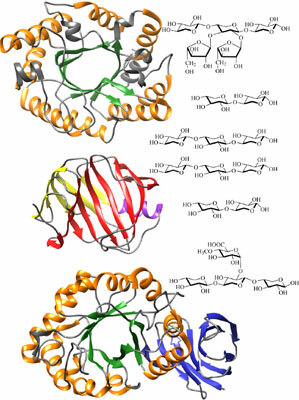 Endo-xylanases are found in at least eight different glycoside hydrolase families (GH), and can either have a retaining or an inverting catalytic mechanism. To date, it is mainly retaining endo-xylanases that are used in applications to produce (A)XOS. Enzymes from these GH-families (mainly GH10 and GH11, and the more recently investigated GH30) are taken as prototypes to discuss substrate preferences and main products obtained. Finally, the need of new and accessory enzymes (new specificities from new families or sources) to increase the yield of different types of (A)XOS is discussed, along with in vitro tests of produced oligosaccharides and production of enzymes in GRAS organisms to facilitate use in functional food manufacturing. Xylanase, glycoside hydrolase, XOS, AXOS, arabinooligosaccharides, GH10, GH11, GH30, subsites.